Just before the second milestone from Princes Risborough, in obedience to my map, I turned to the left and took the right-hand road at a fork. For a quarter mile this was a narrow chalky lane, having at its entrance a sycamore and a thatched cottage, and traveller’s joy all over its low hedge; but crossing a road from Great Missenden it became more important, hard and white, with a green border. I climbed up past the “Red Lion” at Whiteleaf, under Whiteleaf Hill, crossed the Wycombe road, and went down a hedged and rutty lane, laving the spire of Princes Risborough half a mile below on the right. Here is Thomas, the orienteer, leaving specific instructions and directions to any who choose to follow in his weary footsteps. It’s hardly scintillating reading, in any case. 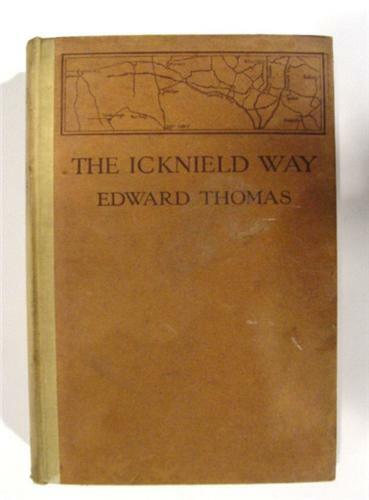 But while these passages were at best disappointing and at worst a drudge to read, The Icknield Way has its share of beautiful moments, dripping with poetry, thick with Thomas’ struggle to express something strange and mysterious without quite having found his medium. The rooks had been talking in my sleep much too long before I started next day. Their voices and the blazing window-blind described the morning for me before I stirred… The long grasses were dewy cool, the trees lightly rustling and full of shadow, the sky of so soft a greyness that it seemed and impossible palace for a sun so gorgeous. What a start to the day, full of light and freshness and happy beginning. Just as I was turning to get water for myself a human being with black hair and wild eyes looked out of an upper window and hailed me with a kind of scream … She was a thin, hawk-faced woman, bare and brown to the breast, and with glittering blue eyes, and in her upper jaw three strong teeth. They go on to have a bizarre conversation about living in the moon. Later there is a ‘jaunty’ landlady, with a ‘skittish, falsetto laugh’, ‘anxious to tell me that much as she liked a country life she missed the gas and the bathroom of a London house.’ Often these encounters strain to be cheerful, such as when he offers observations on the jolly life of a country inn, but they are only a passing brightness, and Thomas’s dark mood soon catches up with him. He was a lean, indefinite man; half his life lay behind him like a corpse, so he said, and half was before him like a ghost … He said that he had been digging all day in a heavy soil, often jarring the fork against immovable flints, lifting more often that not a weight of clay only just short of the limit of his strength. He had thought and thought until his brain could do nothing but remain aware of dull misery and the violent shocks of the hard work … He was stiff and yet unsatisfied with the result of his labour; he felt the dullness of his eyes; and no thing or person in the world or out of it came into his mind with any conscious delight or quickness; yet he still looked along the ridges of the hills from one end to the other, from star to star, without a thought save the sleeping, underlying one that he was growing old. In moments like this, Thomas’s unhappiness and exhaustion with life become a beautiful means of conjuring something quite mysterious. He writes about darkness falling and the landscape fading and becoming indistinct, ‘slowly the solid world was whittled away’. The all-night rain puts out summer like a torch. In the heavy, black rain falling straight from invisible, dark sky to invisible, dark earth the heat of summer is annihilated, the splendour is dead, the summer is gone. The midnight rain buries it away where it has buried all sound but its own. I share his wish, for in those moments when the mystery of the road shines from the chalky path, it is a shimmering, remarkable book indeed. One of my most favourite things is going for a walk. I am at my happiest when strolling along – definitely not too fast or strenuously – looking at beautiful scenery, be it on Hampstead Heath, Hampshire, or Hackney Wick. Aside from the views, one of the things I love most about walking is talking. 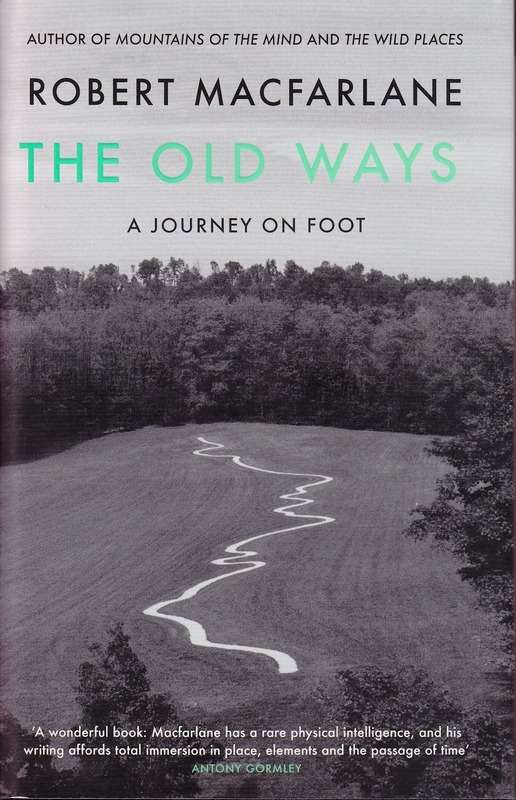 I wrote about Matthew Hollis’s biography of Edward Thomas here, in which he wrote about Thomas and Frost’s habit of ‘talk-walking’. 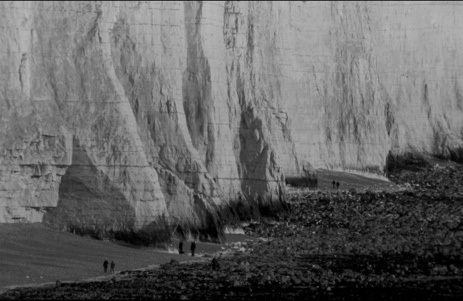 They’d go off into the fields and walk for hours, talking all the while, usually of poetry and other lofty things. No doubt my own talk-walks are a little less high-brow than Edward Thomas’s. But I love the way that once one’s limbs are loosened, one’s tongue is loosened too. All sorts of things that one might normally struggle to talk about come bubbling up like water from a spring – and one babbles away quite easily. Of course, if there’s no one for company on a walk, then babbling away to oneself looks at best eccentric. Virginia Woolf did it, striding through the Sussex countryside, stomping out the plots of novels, talking to herself all the way. I might hum to myself a little, but usually, if alone, the talking goes on in my head, my thoughts chattering away silently to themselves. When I feel a bit stuck with my writing – when I get a horrid feeling like there’s a blockage in a key synoptic pathway in my brain – a walk usually sorts it out. Although, when I walk, my thoughts refuse to follow a straight trajectory and dart all over the place making nothing at all coherent, just a very satisfying scribble. It’s when I get home afterwards and sit down to write, that I find the scribble’s unlocked the blockage and I’ve leapt ahead. Phew. I feel sure there must be plenty of women who walk and write. 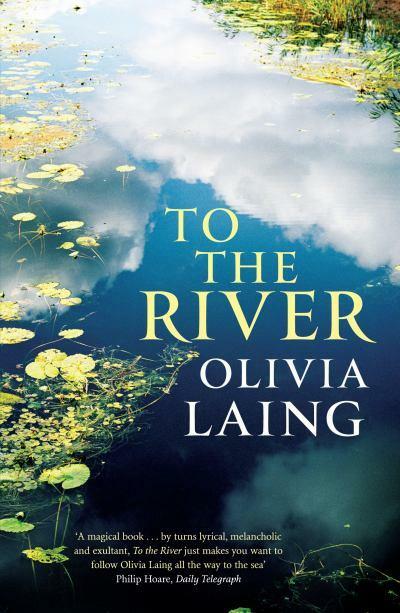 There’s Virginia Woolf for a start, and there’s also Olivia Laing, whose To the River is just out as an attractive paperback. But, with these exceptions, I really can’t think of any other women who write about walking. It’s so peculiar! 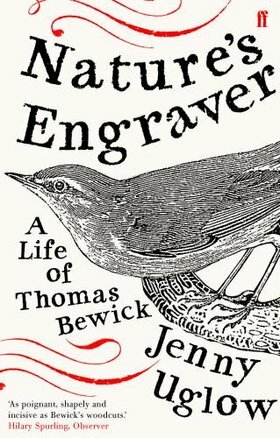 If you think of the big names in English nature-writing (aka walk-writing), they’re all men like Edward Thomas, Robert Macfarlane and Roger Deakin. 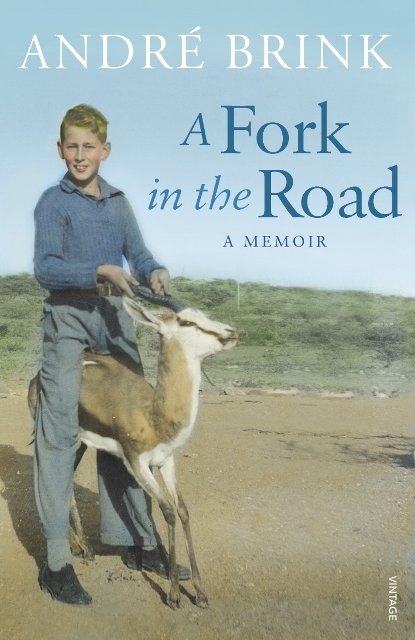 Travel further afield and there’s Patrick Leigh Fermor, Norman Lewis and Laurie Lee. Where have all the women gone? Well perhaps they just walked and talked or walked and thought, without writing it down afterwards. Perhaps we women don’t share the stereotypically ‘male’ impulse to spot and catalogue things obsessively, or perhaps we simply don’t have enough confidence in our walks to commit them to paper. Or perhaps I am just yet to find these elusive women walk-writers. I’d be grateful for any pointers, those of you who know something I don’t. Well, I’m very pleased that Olivia Laing wrote about her walk along the River Ouse. She walks alone, letting her mind meander along all sorts of fascinating watery diversions. 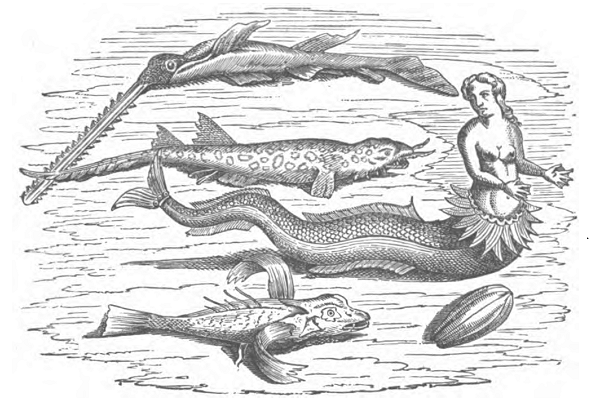 Among other things, we get a folklore tale of faeries, a good bit about the Styx, the tragic story behind The Wind in the Willows and there is the frequent tug of Virginia Woolf, who, of course, drowned herself in the Ouse. I particularly like the way Olivia Laing doesn’t always pretend to be in a bucolic dream in the middle of nowhere. We are jolted back to the twenty-first century by having to cross an A-road, gobbling a curry for supper, or overhearing a filthy conversation in a pub car park. This is definitely the English countryside of today, which makes the moments of wildness all the more special. 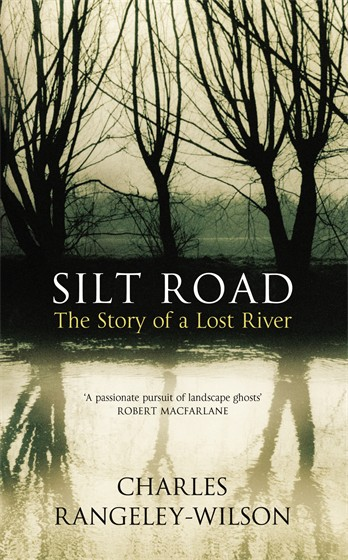 Our countryside is now cris-crossed by noisy roads, and our rivers, often as not, end in container ports, changed from meandering streams into ‘an industrial river, dark as oil, its surface opaque and unrevealing’. But the rivers are still there and one can still find beauty in their surroundings, even if that beauty can be jagged and rather unexpected. Laing gives us both ‘the elder foaming with flowers the colour of Jersey cream’ and the sugared fennel seeds in the Indian restaurant, leaving ‘the ghost of aniseed … on the tip of my tongue like a word I knew but could not speak’. Thanks Olivia for the reminder. Yum. The first picture that struck me in the gorgeous new Ravilious book, Ravilious in Pictures: A Travelling Artist, was Wet Afternoon. That’s Edward Thomas, I thought, looking at the man strolling down the muddy hedge-lined track, the green-grey sky streaked with stripes of rain. For there is certainly something joyful about the man in the picture, who looks to be almost hopping or skipping, or at least walking jauntily, undeterred by the inclement weather. Perhaps it is Thomas’s ghost. Perhaps it is Ravilious himself. Or perhaps he is just one anonymous man in a long line of Englishmen who delight in treading through the countryside, most happy and himself with the damp bluster of English air on his face and mud on his boots. As Thomas points out in his striking simile, however awful it seems to be walking in the rain at first, suddenly, surprisingly, one can find it rather wonderful. But James Russell points out in his introduction to A Travelling Artist that Ravilious found the rain could be a bit of a pain, forcing him indoors when he’d far sooner be out in the landscape, using his watercolours. One of the happy side-effects of the rain-forced retreats are the interiors he was forced to paint. I like the way these often show a preoccupation of the outside world, as experienced from the inside. 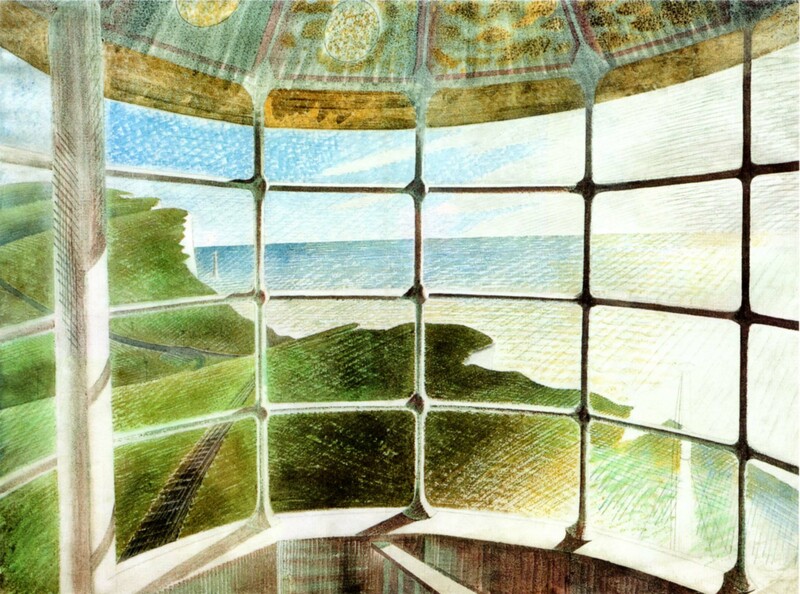 My favourite of Ravilious’s inside/outside pictures are where the window itself is actually shown, such as in Room at the ‘William the Conqueror’ and Belle Tout Lighthouse. The first is intriguing in any case due to the strange dark patch in the middle of the foreground, where Ravilious had initially painted a chair. I expect most of you know by now of my preoccupation with the stories held in houses, how much history can be written in such small traces. Well here is rather an interesting trace. A chair was here, and then it wasn’t, yet it’s left its mark, its imprint. Looking at that patch, it’s impossible not to imagine Ravilious moving the chair there and then perhaps a friend coming in and sitting on it for a while, talking to him over a beer which he found ‘as good as any I ever tasted’. But, aside from this intriguing dark patch, what I love about these two paintings are the way the outside and inside influence each other. The colours are continued – the bluey grey of the exterior landscape in Room is echoed in the curtains and the floor mimics the sea, both in the colour and in the long lines. The outside colours are inside too in Belle Tout Lighthouse. Here I love the way the light streams in, making the window frames cast shadows that remind one of the path outside. And, despite the brilliant sunshine, you can image the cold wind blowing outside, the exposure of being out there. Inside, however, you are protected. Perhaps you can hear the wind whistling, yet you are able to bask in the filtered sunlight. The windows of the lighthouse are quite similar to those in my flat and all yesterday morning I felt the same effect here. It was cold, the wind was howling, rattling the windows, and yet the flat was incredibly bright. There was the same feeling of being connected to the outside and yet protected from it. When one’s view is so taken up with what’s outside, it can be uncanny to feel somehow separated; part of it and yet removed from it. The table at which I’m sitting, for instance, looks out on sunny roofs outside. My view of the roofs and chimneys is utterly connected to my table, to my experience of being in my flat. And yet, those roofs are far away and separated not only by distance but by windows too. 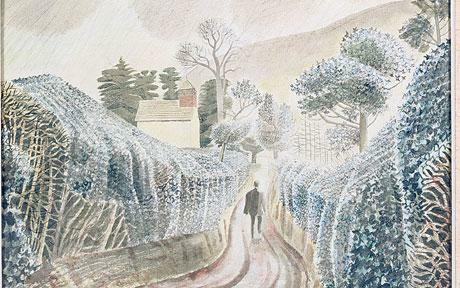 Sometimes the connection can make one forget the separation, and to be reminded of it so forcefully in Ravilious’s paintings feels somewhat shocking. Sometimes this outside/inside tension is extended to strange places that seem to be both outside and inside at once. 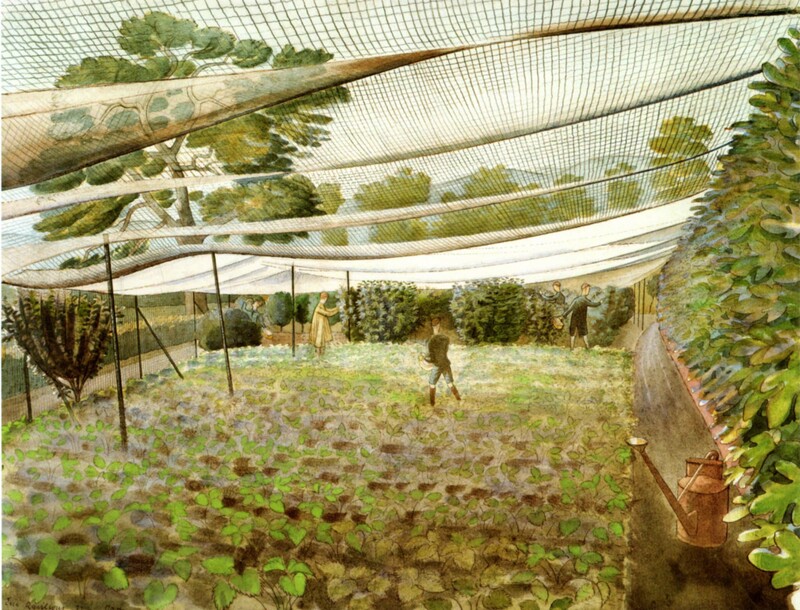 Most striking, to me, is Strawberry Bed, in which Ravilious portrays a space that is outdoors, yet also undercover, the netting forming a permeable barrier between the sky and the ground. Russell points out the ‘hallucinatory detail’ of the nets and also ‘the peculiar quality of the space beneath’. It really is an extraordinary picture. There is a similar feel to his painting Geraniums and Carnations which is filled with diffuse grey-white light but this time the effect is from a glasshouse. And, again, it is the ceiling of the glasshouse where the eye is drawn; this point of connection and separation is where the pillars are pointing and the flowers are climbing towards. I’m sure you’ll find your own points of intrigue and fascination in this book. 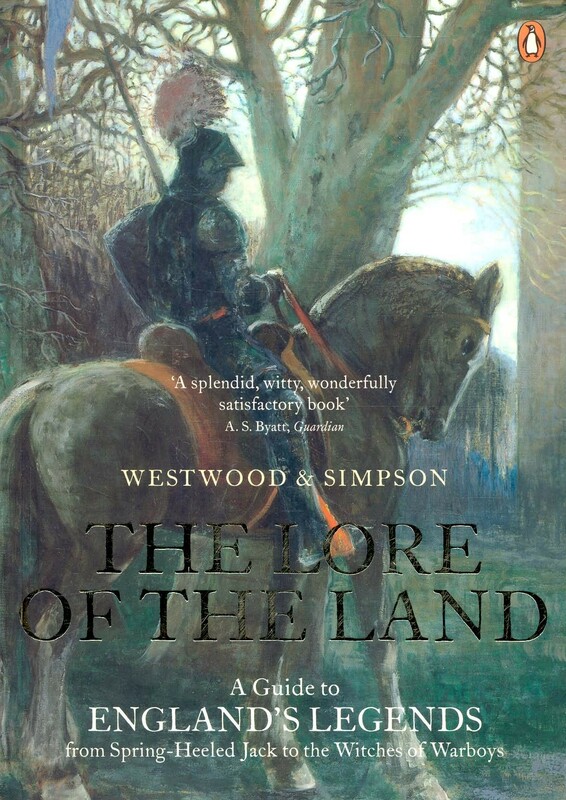 It really is a lovely thing, wonderful to leaf through, full of beautifully-reproduced paintings at which one can happily stare and dream over for hours. I can’t believe it’s been such a long time since the most recent instalment of my Literary A-Z. For those of you who’ve been waiting with baited breath since the battle of Rushdie vs Richardson, I can only apologise. But, for the sake of making it slightly more interesting, some other S authors that I’ve loved are Ali Smith, J.D. Salinger and – of course – Dodie Smith. My old boss used to publish Salinger’s books and told me that he was very tricky with his covers, never letting a picture on the front, insisting that the design be purely typographical. At school I thought Salinger’s collection of short stories, For Esme with Love and Squalor, was the best book ever. I read it obsessively, many times over. It was a love made defiant when told by my English teacher that it wasn’t substantial enough to be the subject of an essay. Pah, I thought, you just don’t understand. It was all deeply teenagerish and a little silly. 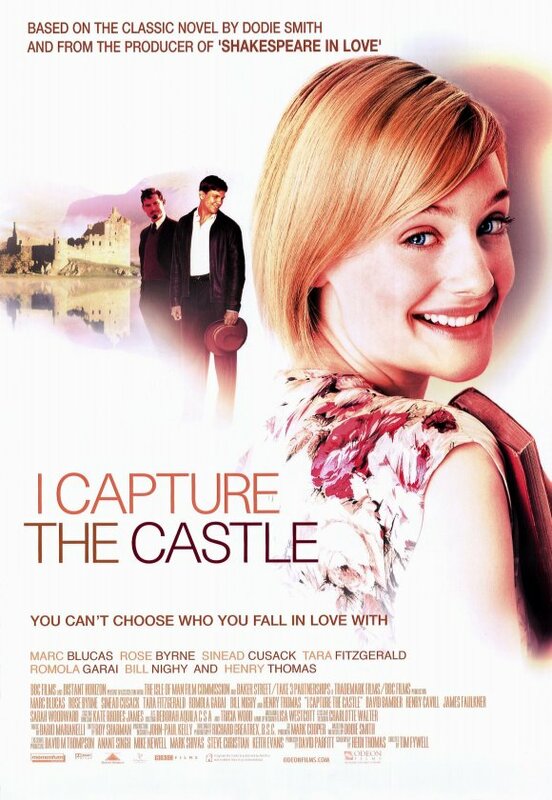 Speaking of silly teenagers, last night I happened to watch the DVD of Dodie Smith’s I Capture the Castle, which many of you know is one of my all-time-favourite books. It was a rare instance of being almost enjoyable on film as on the page, thanks mostly to Romola Garai and Bill Nighy. The funny thing was that the film looked oddly like a Brora photoshoot, which, given they’re supposed to be an impoverished family and Brora cardigans cost upwards of £200 a pop, does seem peculiar. Particularly fun bits were the scenes shot in the RIBA building, which was dressed up as a thirties department store. Does anyone else love playing the London place-spotting game when watching anything on screen? Annoyingly the husband tends to get it about five seconds before me each time! A brilliant S-link is that not far into the film of I Capture the Castle, everyone’s trying to get the Americans’ car out of the mud when James Mortmain (aka Bill Nighy) curses the storm’s ‘cataracts and hurricanoes’. Looking back through the book I can’t find these exact words; instead, Dodie Smith just writes that ‘he was freely damning the weather’. Well Bill Nighy evidently freely damned the weather in the words of Shakespeare’s King Lear. One great S is brought into another great S. Splendid! T is a little more tricky. Edward Thomas? Colm Toibin? Elizabeth Taylor? I’m going to confess that I’ve never got on particularly well with Tolstoy. I’ve begun Anna Karenina several times, and never got much past the ice skating episode. Perhaps I was just too young. (But I worry that I’ll never love the Russians because I always get so muddled with all the long names!) Some Tolstoy that I did enjoy was The Kreutzer Sonata, which Penguin published as a pretty little Great Loves edition. I think I must go for Edward Thomas. 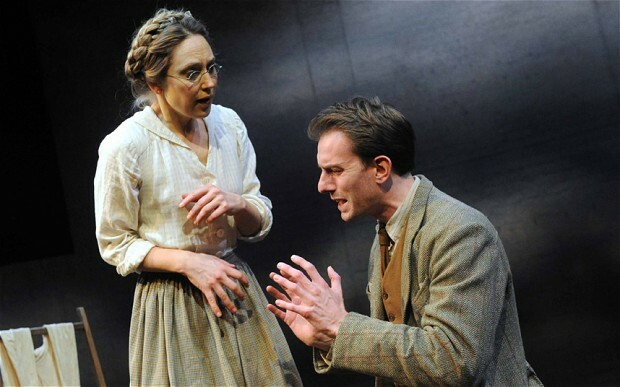 However much I loved The Blackwater Lightship and Mrs Palfrey at the Claremont, ‘Adlestrop’ wins hands down every time. Even if he was quite horrid to his wife. An impossible letter because I haven’t read anything by John Updike, who seems to be more-or-less the only fiction writer beginning with U. Then again, I haven’t read any non-fiction by Jenny Uglow, but I suspect I’d enjoy her much more than Updike. I feel particularly fond of Jenny Uglow, in spite of the fact that I’ve not yet read any of her well-acclaimed biographies, or her book about English gardens. This is because as well as being such a successful writer, she is also a very well-respected editor. Editorial Director at Chatto & Windus no less. When I was shuffling around at the bottom of the publishing food chain, trying to write a novel in the mornings before arriving at the sterile office, the thought that there were very successful publishers who also managed also to have writing careers was tremendously inspiring. It made me think that I might not have to choose between writing books and making them, that I could somehow do both. How I longed to bump into her, strike up a conversation and be given a cup of tea and taken under her wing! Needless to say I never had the courage even to say hello, and, when it became clear that one must be far more senior and important than me to go part-time in publishing and that I couldn’t go on forever doing all my writing very early in the morning and then being brain-dead all afternoon, I took a different path from Uglow and side-stepped out of publishing. But well done her, as there must have been a time when she stuck to her guns and said, no I’m not leaving, I’m going to make this work and do two things very well indeed. U goes to Jenny Uglow. 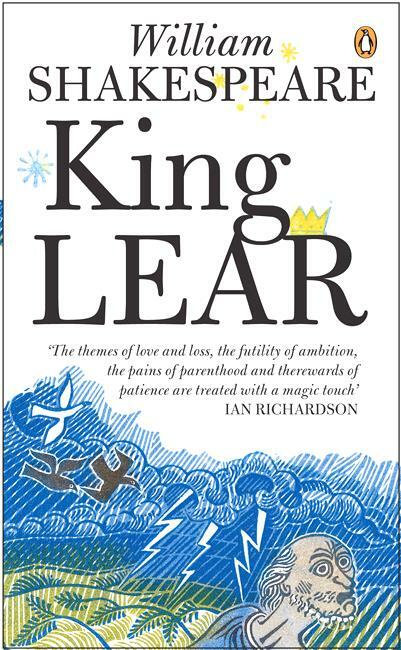 It is somewhat peculiar to be only half-way through February, yet already to have read what will be my best book of the year. 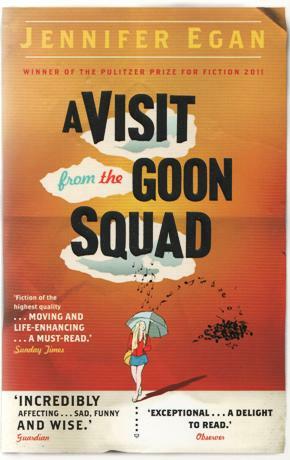 While there are several books that easily make me laugh out loud, or at least snigger, there are very few books that have made me cry. I’m afraid this was one of them. The sad yet inevitable thing about most biographies is that the subject tends to be dead. All the way through you know it’s coming. It’s not like in a novel, where although there might be the threat of untimely death, there’s a reasonable chance the main character will survive. 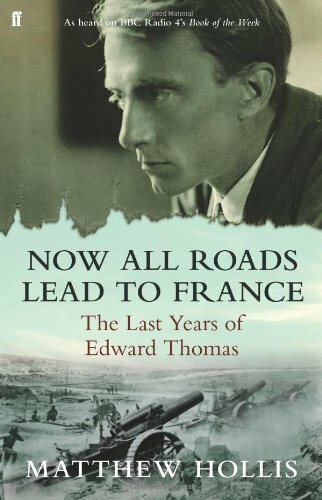 Matthew Hollis announces the tragic death of Edward Thomas at the very beginning of Now All Roads Lead to France. It was on Easter Monday, 1917, the first day of the Arras offensive. The contents page reveals that the book stretches only from 1913 to 1917. We will be with Edward for just four years. His death looms over the book, making one dread the turning of the pages, wanting to put off the inevitable for as long as possible. It was a debt that Frost feared he could never repay. But he had already begun to repay it. 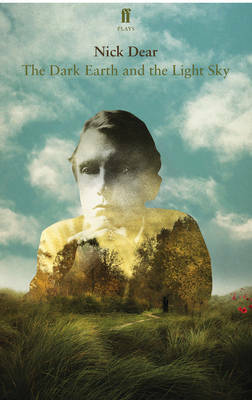 Edward Thomas was about to become a poet. I promise, when you read it in context, it feels like edge of your seat stuff. Then we stopped at Adlestrop, thro the willows cd be heard a chain of blackbirds songs at 12.45 & one thrush & no man seen, only a hiss of engine letting off steam. Stopping outside Campden by banks of long grass willow herb & meadowsweet, extraordinary silence between the two periods of travel – looking out on grey dry stones between metals & the shiny metals & over it all the elms willows & long grass – one man clears his throat – and a greater rustic silence. No house in view Stop only for a minute till signal is up. Hollis is such a tease! It is impossible for anyone who’s heard of Edward Thomas to read these notes without holding their breath. This is it. This is the beginnings from which the magical poem will sprout, just a few months later. 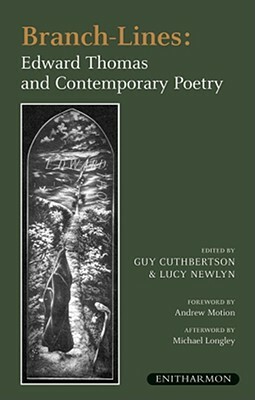 Yet Hollis doesn’t so much as mention ‘Adlestrop’ the poem here. He just skips on to the weather at Dymock. Needless to say, I read the next sixty pages very quickly, longing to get to the moment of composition itself. It’s fascinating to see what Thomas has taken from his notes: ‘willow herb & meadowsweet’, the ‘hiss of engine letting off steam’, the man who’ clears his throat’. And, of course, the ‘chain of blackbirds songs’. Perhaps it’s even more fascinating to see what has been omitted. The ‘grey dry stones between metals & the shiny metals’ don’t appear in the poem at all. Strange, as the image of shiny metals could make one think of war, which was very much on Thomas’s mind. Perhaps he wanted to expunge all notion of the war from the poem and preserve it as a final pastoral moment before the war began. But I must stop all this gushing about ‘Adlestrop’. Robert Macfarlane points out in his nuanced review of Now All Roads Lead to France for the Guardian that the book ‘helps us to understand how much more there is to Thomas than willow-herb and meadowsweet and haycocks dry’. So I shall endeavour to leave the beauty of ‘Adlestrop’ behind. Frost chuckling as Thomas havered over which route to take, Thomas grinning at another enquiry from Frost as to whether they had much further to go. They seem little more than schoolboys – carefree and happy, free from the weight of the world. And yet, not unlike Thomas’s poetry, beneath the bucolic dream lurks a troubled reality. Thomas’s havering over which route to take is symptomatic of the indecision with which he is constantly plagued. And, for Thomas, this indecision often manifests itself over his physical place – he is literally not sure which route to take. Should he live with his wife, or stay with his friends? Should they live in London or in Hampshire? Should he go to confront the gamekeeper or run away? And there is the vital decision which hovers over most of the book – should he fight in France or emigrate to America to live with Robert Frost? And, rather neatly, the poem at the heart of it, isn’t ‘Adlestrop’, but Frost’s even more famous ‘The Road Not Taken’. It is unfortunate to say the least that what Frost meant as a little tease about Thomas’s indecision was taken so seriously by him, even going so far as to hasten his decision to go to France. Of course it has also been taken seriously by so many since him. The traditional either/or is replaced with an incomparably more complex notion of both/and. Thought may follow one particular path, but there are all the other paths not taken, and all the other paths still being thought through, or not yet thought of, that language can latch on to at different stages as it goes. It’s taken the example of Edward Thomas for me to fully understand this idea. For surely that’s exactly what happened to him. Thomas enlisted in Summer 1915 and thus embarked upon his army career that would see him volunteer to serve at the Front. He chose the road to France, not America; the road of soldier, not poet. 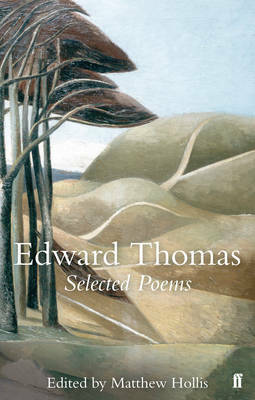 Yet, apart from a short gap, all the while Thomas was in the army, he continued to write poetry. A nice detail in the book is a photograph of one of his poems composed in 1916. On the page it looks just like prose. Thomas disguised it so that none of the other soldiers would know he was a poet. But it certainly is poetry, with capital letters used to indicate new lines and paragraph breaks for new stanzas. You are among the unchanged things that I can not or dare not think of except in flashes. His friendship with Frost is ‘unchanged’, their paths still close even though Thomas had chosen the path away from him. And, luckily for us, while physically treading the soldier’s road to France, Thomas still mentally trod the road of the poet.